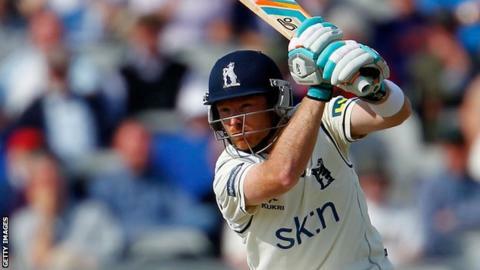 Ian Bell laid down a marker in front of incoming England head coach Peter Moores with a composed 75 on day two for Warwickshire against Lancashire. The visitors built a 69-run lead at Old Trafford, closing on 316-9 on day two as Bell, Varun Chopra and William Porterfield all posted half-centuries. Glen Chapple claimed his 900th first-class wicket when he had Chopra lbw. But James Anderson toiled for 0-82 and it was Tom Smith (4-67) who took the bowling honours for the Red Rose side. Chopra (52) and Porterfield (77) laid the perfect foundation for Warwickshire with an opening stand of 127 before the miserly Simon Kerrigan (1-36 off 21 overs) broke the partnership when Porterfield chipped to Wayne White. Laurie Evans (17), Ateeq Javid (25) and Tim Ambrose (23) all achieved starts, but could not stay with Bell as Chapple and Smith kept the visitors from racing away. Bell's innings came to an end when Wayne White (2-71) removed his off-stump with a superb off-cutter, and having dismissed Chris Woakes, Jeetan Patel and Chris Wright for just eight runs between them, Moores' side will head into day three of his final match in charge hopeful of making inroads quickly. "Lancashire bowled really well and deserved their flurry of wickets late on in the day. "The Red Rose county's hard work in the field meant they are still in this game when it appeared Warwickshire might go on to post a sizeable first-innings lead. "But Lancashire will be hoping that a last-wicket partnership on the third day does not turn into anything too costly."